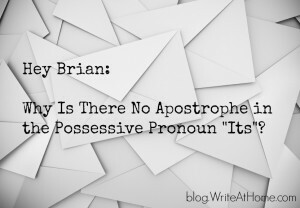 Hey Brian: Why No Apostrophe in Possessive Its? Home / Blog / Hey Brian: Why No Apostrophe in Possessive Its? It’s not a quirk at all, Kyle. In fact, it’s perfectly consistent. Unlike nouns, which become possessive by adding apostrophe-s (or s-apostrophe), pronouns have a distinct possessive form. We call it the possessive case (as opposed to nominative or objective case). Possessive case pronouns show possession without apostrophes: my, your, his, her, our, their… and its. In other words, pronouns are different from nouns in how they show possession. Don’t compare its to door’s, but its to my, your, his or her. This comes in handy, by the way. If we didn’t have this class of possessive pronouns, and used apostrophe-s with pronouns as well as nouns, we wouldn’t be able to distinguish the possessive it’s from the contraction it’s. I’d love you hear your comments or questions. Please leave them in the Reply area below. I don’t understand your point, Raluca. Would the reader have asked the question if he hadn’t been a Facebook user at the same time?